Well, hello September and Happy Labor Day! In case you missed it, I brought my youngest daughter on board a couple of months ago to help me blog occasionally and to give her twenty something take on things. Once a month we blog about stuff we love. Sometimes it’s something old that has stood the test of time. Sometimes it’s something new. And sometimes it’s something blue. Oh, wait, that’s a wedding thing. Never mind. It’s just stuff we love. Period. Here’s what we loved in June and July! 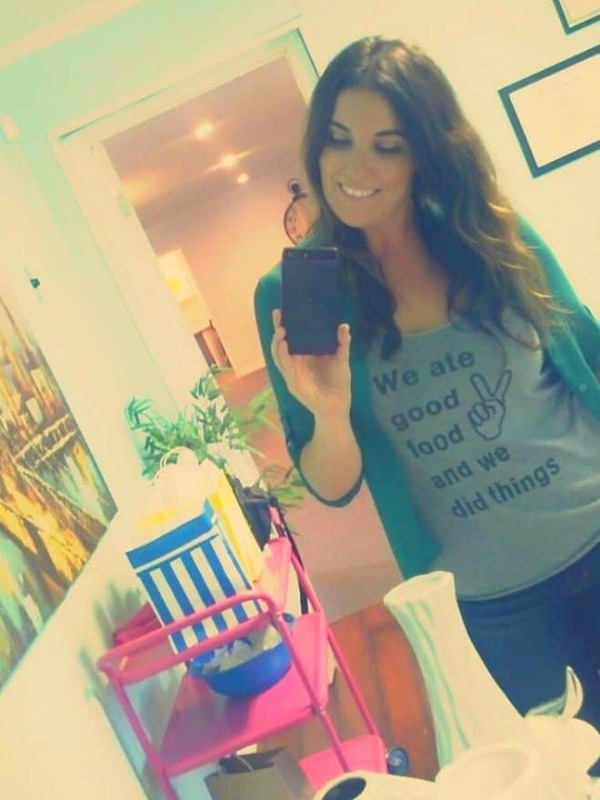 My “We Ate Good Food and We Did Things” shirt. My dad is always saying something quotable. He was telling a story while preaching a couple Sundays ago and when referring to my parents St. Lucia trip he said, “We ate good food and we did things.” Um, story of my life! So I made a shirt out of it. It’s funny, it’s comfortable and I get to wear a family joke. You can make one of your own at www.uberprints.com. Note from Alli: I’m not planning on dying for a very, very long time. However, I’m a bit of a control freak and a planner. I like things done the way I like things done. I love to throw the perfect party and can’t stand the thought of leaving an important event like a funeral (which will probably be called a farewell gala) to party planning amateurs (aka my family). So I’m in the very early stages of planning my farewell party. It’s my prerogative. FYI: It will not be a traditional service because my parties must be different. It’s who I am. Now, back to Caitlin’s stuff! This was part of my Birthday present from my boyfriend, who I like to call “Sweet David,” because well, just ask anyone, he’s as sweet as pie. 🙂 He took me shopping and I had been wanting to get my hands on this bronzer for a LONG time. I’m hitting pan on my Benefit’s Hoola Bronzer and it has served me well. It’s matte, blendable and provides a natural looking tan/contour. However, in the summer I have to build it up (layer) pretty good to get it to show up. Chocolate Soleil to the rescue!! This bronzer is deep, matte and has a little more red in it (in a good way). Not orangy. The best part? It’s made of real chocolate and smells AND tastes like real chocolate. How do I know, you ask? I was getting a little crazy with my contour and it got in my mouth. It was snowing bronzer. And it was awesome. Note from Alli: I had to ask Caitlin what “hitting pan” meant. It’s a makeup term that means you’re running low and you can see the bottom I think. Supposedly, everyone that knows anything about makeup should know that terminology. I digress. OPI says hello to your wall! Need a new paint color? Look no farther than your manicure. 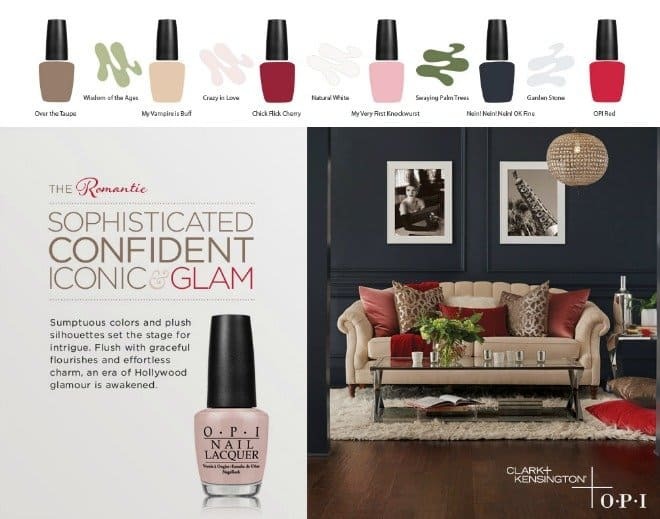 Yep, a couple of months ago OPI inspired Clark & Kensington’s paint palette at Ace Hardware. And I’m in love! 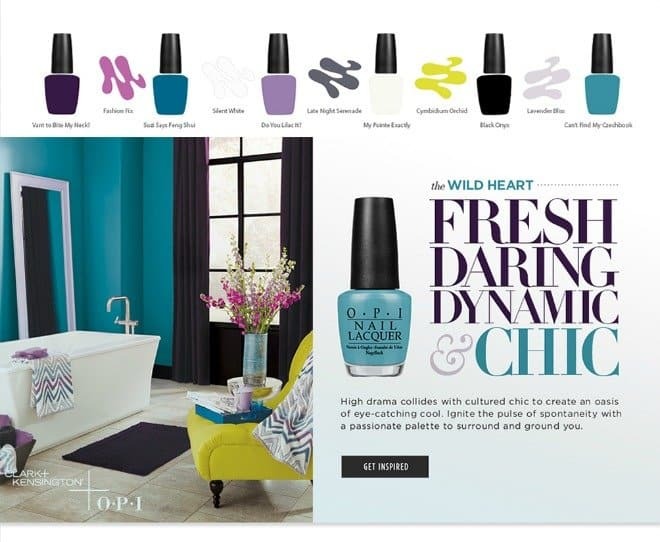 The 18 OPI colors range from the sheer Gray My Point Exactly to the dramatic teal Can’t Find my Czechbook! 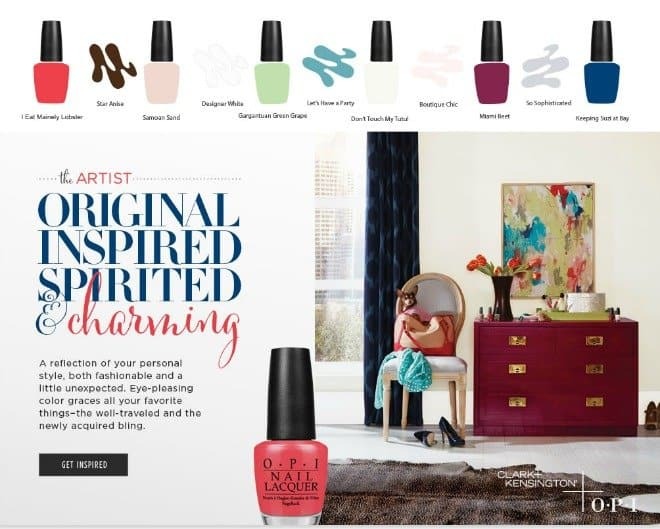 Because I’m so thankful for all of you who read my blog, I’m giving away a $50.00 gift card to Ace Hardware so that you can try the new OPI wall color! You can enter at the end of this post. August is also my birthday month. I turned the big 3-0 on August 14, 1988 (gotcha) five days after giving birth to Caitlin. It’s just a me thing, but I wanted to have all of my children before I turned 30. I know women wait way beyond 30 now. But you’ve got to realize this was in the late 80’s. Looking back, I wouldn’t have it any other way. I’m really enjoying all of my grown children and my grand kids while being 39 and holding! Thirty-nine is the new 50 something, right? When I was a little girl, my sister, Melinda, and I always sung this little song (among many) that we made up. As soon as August arrived, I would begin to sing, “14 days to my birth-day, 14 days to my birth-day” and would repeat it every day with the corresponding number of days, until the big day arrived! Melinda would do the same thing in January, her birthday month. Psst: I still do it, but don’t tell anyone! I even texted it to my sister in Colorado. You’re never to old to celebrate birthdays! OK – I’m pretending to be a rock star here, but the entire family (kids and grands) is spending the week of Labor Day at the beach (except for Max, he’s spending the week on a huge blueberry farm/aka dog boarding kennel). We’ll enjoy one more week of summertime fun before our thoughts and minds turn to fall (as I’m sipping my coffee with pumpkin spice creamer)! What did you love about August? I love grey, too! My daughter and I recently redid her bedroom and we used the prettiest grey. I love green colors in paint! Green is a soothing fresh color to me. I’ve used various shades of green over the years. I always have a hard time picking out paint colors because I love most of them. I love August because it means the end of summer is near! I am a Fall and Winter kind of girl. Debbie, you know I’m a summer girl all the way! 🙂 But I do love the holidays in fall and winter. Does that count? Those colors are gorgeous! I had heard about them and I’m finally glad I got to see them! This was such a fun, cute post and I love how you included your daughter. I laughed out loud when I read about “hitting pan” because sometime being a makeup lover-you realize that people don’t understand what you’re talking about sometimes. Hey August is also my Birthday month. I think it is the best month of the year to have a Birthday, good weather and fresh garden food to celebrate. August is a very popular birthday month, right? Happy belated birthday, Anna! I love the shirt – remember, I am Caribbean so I know about the food there…Love those nail colors!! I knew you would understand, Zan! The food is always amazing in the Caribbean, even the simple rice and beans are so much better there! My favorite thing about August? Hmmm…probably my in-depth exploration of Atlanta! Such a great post! I happen to love that song, too 🙂 It’s in my car CD player right now, actually! Omgosh so many thing! I love that shirt, your daughter looks so much like you and OPI for my house?? ?Shut the front door! I would paint all of my walls turquoise and my toes and fingers. That is my GO TO color and this would drive my husband crazy. I really love the 2nd collection of colors.. Though I’ll wear any kind on my feet, I don’t really paint my finger nails much though. I’m loving that t-shirt! That is such an amazing idea! And , I’m also loving every one of those rooms – the romantic, I’m dying for. What a fun recap of what seems to have been a great month for both you and your daughter! I love the shirt BTW…great quote! A $50 Ace Hardware Gift-Card would come in so handy right now. We moved in July & will be painting very soon, along w/ so many other updating tasks. I love color, but for the most part we will be doing neutral beige w/ a few accent walls. Red would be fun! Thanks for offering the give-away. I love OPI nail-polish by the way. I just finished painting my nails w/ OPI. My house is open concept and the great room is Happy Trails (beige) and the adjoining dining room is red. It’s been red for several years and I haven’t grown tired of it yet. My craft room is BM Palladian Blue, and it’s become my favorite paint color ever. I bet it’s beautiful! And now I’m jealous of your craft room! I wish I had one! I like gray with blue undertones. I remember trying to pick out the perfect gray for a room I was painting and how many shades of gray I had to test before finding the right one for that room. My favorite thing about August was the day I left BOTH of my boys at college. Not because they were leaving me, but seeing them together waving and smiling as we pulled away. Knowing big brother was there to help his little brother make such a transition put my heart at ease! Pulling away I KNEW that we have done a great job raising such wonderful young men! They have my heart forever!! What a great accomplishment! I bet little brother was glad big brother was there, too. How awesome!